20 A None No Power Seat 20 A is a standard Premium Economy seat that may have slightly restricted legroom due to the position of the bulkhead. The position of the bassinets may be bothersome. 20 C None No Power Seat 20 C is a standard Premium Economy seat that may have slightly restricted legroom due to the position of the bulkhead. The position of the bassinets may be bothersome. 20 D None No Power Seat 20 D is a standard Premium Economy seat that may have slightly restricted legroom due to the position of the bulkhead. The position of the bassinets may be bothersome. 20 E None No Power Seat 20 E is a standard Premium Economy seat that may have slightly restricted legroom due to the position of the bulkhead. The position of the bassinets may be bothersome. 20 F None No Power Seat 20 F is a standard Premium Economy seat that may have slightly restricted legroom due to the position of the bulkhead. The position of the bassinets may be bothersome. 20 G None No Power Seat 20 G is a standard Premium Economy seat that may have slightly restricted legroom due to the position of the bulkhead. The position of the bassinets may be bothersome. 20 H None No Power Seat 20 H is a standard Premium Economy seat that may have slightly restricted legroom due to the position of the bulkhead. The position of the bassinets may be bothersome. 20 K None No Power Seat 20 K is a standard Premium Economy seat that may have slightly restricted legroom due to the position of the bulkhead. The position of the bassinets may be bothersome. 21 A None No Power Seat 21 A is a standard Premium Economy seat that is missing a window. 21 K None No Power Seat 21 K is a standard Premium Economy seat that is missing a window. 24 A None No Power Seat 24 A is a standard Premium Economy seat that is missing a window. 24 K None No Power Seat 24 K is a standard Premium Economy seat that is missing a window. 26 A None No Power Seat 26 A is a standard Premium Economy seat, however, the proximity to the lavatories may be bothersome. 26 C None No Power Seat 26 C is a standard Premium Economy seat, however, the proximity to the lavatories may be bothersome. 26 D None No Power Seat 26 D is a standard Premium Economy seat, however, the proximity to the lavatories may be bothersome. 26 E None No Power Seat 26 E is a standard Premium Economy seat, however, the proximity to the lavatories may be bothersome. 26 F None No Power Seat 26 F is a standard Premium Economy seat, however, the proximity to the lavatories may be bothersome. 26 G None No Power Seat 26 G is a standard Premium Economy seat, however, the proximity to the lavatories may be bothersome. 26 H None No Power Seat 26 H is a standard Premium Economy seat, however, the proximity to the lavatories may be bothersome. 26 K None No Power Seat 26 K is a standard Premium Economy seat, however, the proximity to the lavatories may be bothersome. 45 A None No Power Seat 45 A is a standard Economy Class seat that has extra legroom due to the exit however, the proximity to the lavatories and galleys may be bothersome. 45 B None No Power Seat 45 B is a standard Economy Class seat that has extra legroom due to the exit however, the proximity to the lavatories and galleys may be bothersome. 45 C None No Power Seat 45 C is a standard Economy Class seat that has extra legroom due to the exit however, the proximity to the lavatories and galleys may be bothersome. 45 D None No Power Seat 45 D is a standard Economy Class seat that may have slightly restricted legroom due to the bulkhead. The proximity to the lavatories, galleys and position of the bassinet may be bothersome. 45 E None No Power Seat 45 E is a standard Economy Class seat that may have slightly restricted legroom due to the bulkhead. The proximity to the lavatories, galleys and position of the bassinet may be bothersome. 45 G None No Power Seat 45 G is a standard Economy Class seat that may have slightly restricted legroom due to the bulkhead. The proximity to the lavatories, galleys and position of the bassinet may be bothersome. 45 H None No Power Seat 45 H is a standard Economy Class seat that has extra legroom due to the exit however, the proximity to the lavatories and galleys may be bothersome. 45 J None No Power Seat 45 J is a standard Economy Class seat that has extra legroom due to the exit however, the proximity to the lavatories and galleys may be bothersome. 45 K None No Power Seat 45 K is a standard Economy Class seat that has extra legroom due to the exit however, the proximity to the lavatories and galleys may be bothersome. 57 A None No Power Seat 57 A is a standard Economy Class seat that may have limited recline. The proximity to the lavatories and galleys may be bothersome . 57 B None No Power Seat 57 B is a standard Economy Class seat that may have limited recline. The proximity to the lavatories and galleys may be bothersome . 57 C None No Power Seat 57 C is a standard Economy Class seat that may have limited recline. The proximity to the lavatories and galleys may be bothersome . 57 H None No Power Seat 57 H is a standard Economy Class seat that may have limited recline. The proximity to the lavatories and galleys may be bothersome . 57 J None No Power Seat 57 J is a standard Economy Class seat that may have limited recline. The proximity to the lavatories and galleys may be bothersome . 57 K None No Power Seat 57 K is a standard Economy Class seat that may have limited recline. The proximity to the lavatories and galleys may be bothersome . 58 D None No Power Seat 58 D is a standard Economy Class seat that may have limited recline. The proximity to the lavatories and galleys may be bothersome . 58 E None No Power Seat 58 E is a standard Economy Class seat that may have limited recline. The proximity to the lavatories and galleys may be bothersome . 58 G None No Power Seat 58 G is a standard Economy Class seat that may have limited recline. The proximity to the lavatories and galleys may be bothersome . 60 A None No Power Seat 60 A is a standard Economy Class seat that has extra legroom due to the exit however, the proximity to the lavatories and galleys may be bothersome. 60 B None No Power Seat 60 B is a standard Economy Class seat that has extra legroom due to the exit however, the proximity to the lavatories and galleys may be bothersome. 60 C None No Power Seat 60 C is a standard Economy Class seat that has extra legroom due to the exit however, the proximity to the lavatories and galleys may be bothersome. 60 H None No Power Seat 60 H is a standard Economy Class seat that has extra legroom due to the exit however, the proximity to the lavatories and galleys may be bothersome. 60 J None No Power Seat 60 J is a standard Economy Class seat that has extra legroom due to the exit however, the proximity to the lavatories and galleys may be bothersome. 60 K None No Power Seat 60 K is a standard Economy Class seat that has extra legroom due to the exit however, the proximity to the lavatories and galleys may be bothersome. 61 D None No Power Seat 61 D is a standard Economy Class seat that may have slightly restricted legroom due to the bulkhead. The proximity to the lavatories, galleys and position of the bassinet may be bothersome. 61 E None No Power Seat 61 E is a standard Economy Class seat that may have slightly restricted legroom due to the bulkhead. The proximity to the lavatories, galleys and position of the bassinet may be bothersome. 61 G None No Power Seat 61 G is a standard Economy Class seat that may have slightly restricted legroom due to the bulkhead. The proximity to the lavatories, galleys and position of the bassinet may be bothersome. 7 D None No Power Seat 7 D is a standard Business Class seat however, the proximity to the lavatory and galleys may be bothersome. 7 G None No Power Seat 7 G is a standard Business Class seat however, the proximity to the galleys may be bothersome. 7 K None No Power Seat 7 K is a standard Business Class seat however, the proximity to the galleys may be bothersome. 72 C None No Power Seat 72 C is a standard Economy Class seat however, the proximity to the lavatories and galleys may be bothersome. 72 D None No Power Seat 72 D is a standard Economy Class seat that may have limited recline. The proximity to the lavatories and galleys may be bothersome. 72 E None No Power Seat 72 E is a standard Economy Class seat that may have limited recline. The proximity to the lavatories and galleys may be bothersome. 72 G None No Power Seat 72 G is a standard Economy Class seat that may have limited recline. The proximity to the lavatories and galleys may be bothersome. 72 H None No Power Seat 72 H is a standard Economy Class seat however, the proximity to the lavatories and galleys may be bothersome. 73 A None No Power Seat 73 A is a standard Economy Class seat in the last row of the aircraft that may have limited recline. The proximity to the lavatories and galleys may be bothersome. 73 C None No Power Seat 73 C is a standard Economy Class seat in the last row of the aircraft that may have limited recline. The proximity to the lavatories and galleys may be bothersome. 73 H None No Power Seat 73 H is a standard Economy Class seat in the last row of the aircraft that may have limited recline. The proximity to the lavatories and galleys may be bothersome. 73 K None No Power Seat 73 K is a standard Economy Class seat in the last row of the aircraft that may have limited recline. The proximity to the lavatories and galleys may be bothersome. 8 A None No Power Seat 8 A is a standard Business Class seat however, the proximity to the galleys and position of the bassinets may be bothersome. 8 D None No Power Seat 8 D is a standard Business Class seat however, the proximity to the galleys and position of the bassinets may be bothersome. 8 G None No Power Seat 8 G is a standard Business Class seat however, the proximity to the galleys and position of the bassinets may be bothersome. 8 K None No Power Seat 8 K is a standard Business Class seat however, the proximity to the galleys and position of the bassinets may be bothersome. Eva Air provides Wi-Fi on selected B777-300ER aircraft. Pre- Purchase EVA Wi-Fi voucher codes through the EVA Air website to enjoy a discount. Click here for more information. This EVA Air Boeing 777-300ER aircraft features a three class configuration with 39 flat bed Royal Laurel seats, 56 Premium Economy recliner seats, and 238 standard Economy seats. Row 1 is not sufficiently bad to warrant being marked in yellow. The seats are sufficiently far from the toilets not to be a nuisance but also near enough to be convenient. The forward galleys are not really utilised for preparing food, mostly only pre-departure drinks and storage. The galleys between rows 7 and 8 are where the food prep takes places. I found the Eva Air Premium Economy seat extremely comfortable - with great recline and leg space. The TV screen was also a great size with a good choice of movies. 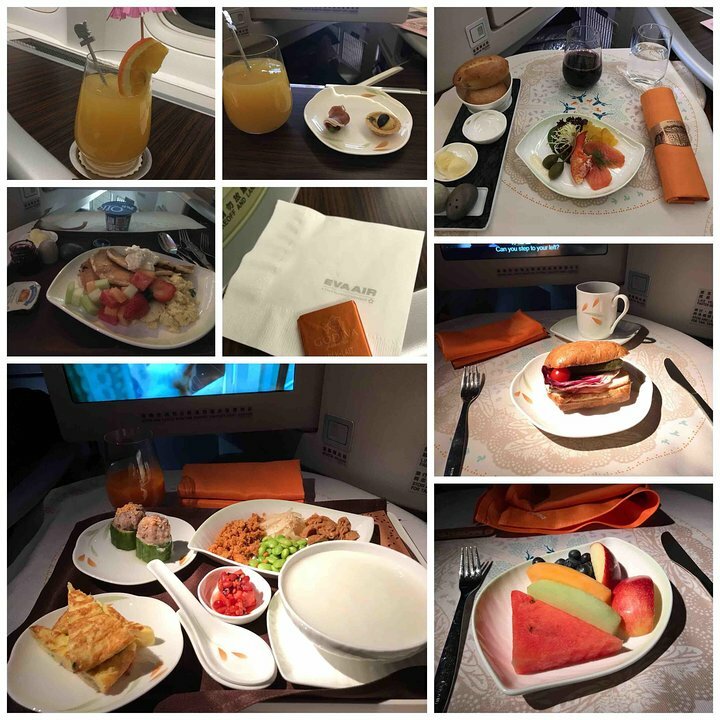 I also noticed that the catering was very upgraded compared to economy, with wine and champagne offered. Overall - very attentive and good service. 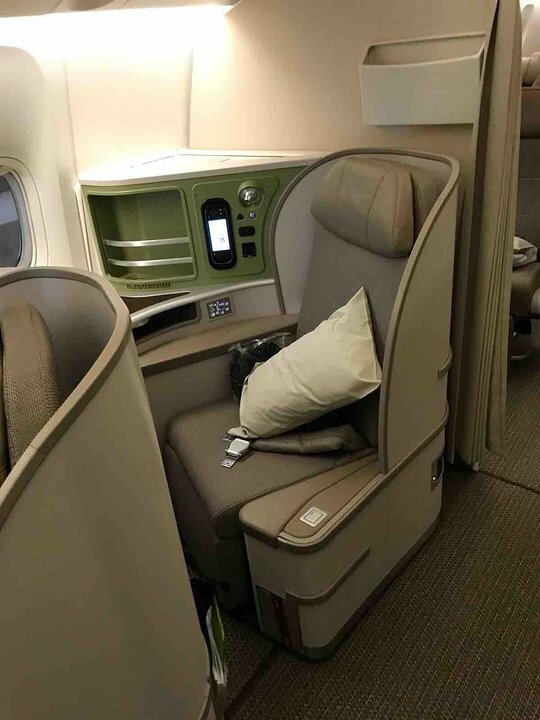 While my flight was only a 4 hour leg, I would gladly choose Eva Air Premium Economy for long haul flights in the future and fond this to be probably the best premium economy product I have experienced to date. Well done Eva Air! I flew from SIN to TPE on 24th Jan 2018. I sat on 9K and the row still the best seat because it had two windows and can see the engine. The foods were pretty good and drank a champange. SEA - TPE - SEA I was seated in 9A on both flights. The seat is in the smaller business cabin with only 4 rows which makes it a little more quiet. The only downside is that general boarding goes through this cabin. The seat is wide and very comfortable, you get even more shoulder room in bed mode when the armrest is lowered. You get two full windows. Nice amenity kit and the pajamas are a nice touch and very comfortable and its for you to keep. Service is excellent and very attentive. While EVA has improved on their catering from a couple of years ago, the food is still their weakest point. On my outbound, I preordered lobster as my main course online which was bland and the portion was small. They also ran out of champagne half way through dinner service as well as one of the two mid-flight snacks. On my inbound, I preordered a duck breast which was overcooked but champagne was flowing. The online menu has so many more selections than what's offered onboard. The two toilets on the port side are huge and make changing in and out of your PJs so much easier. All in all, they were great flights and I will fly with them again in a heartbeat. The restroom was clean, the food was fresh, and I love the seats, they're so comfy! The arms rest is not liftable. If travel with family members, the fixed arm rest could be uncomfortable. 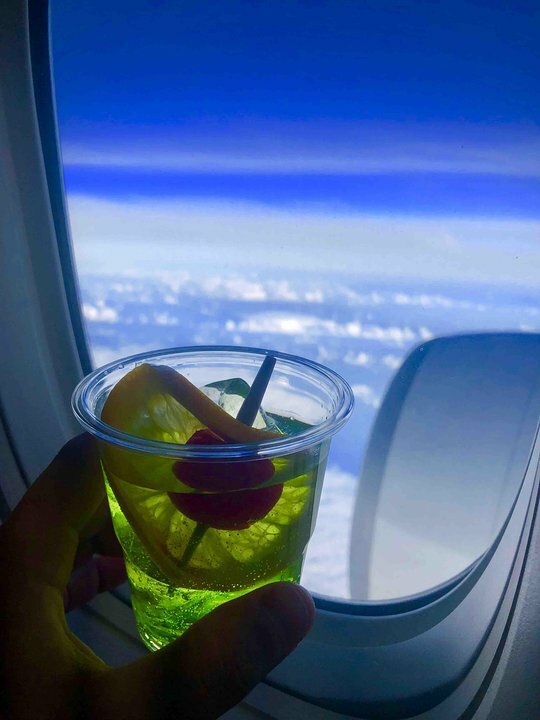 I traveled on the Elite Class on the 21K in the 777. The seat was great with very good IFE system. But neither on 21A nor 21K shares one window with row 20, there was no more window on row 21(only half window that shares with row 20). So if you want a good view, dont choose these two seat. This is a bulkhead Premium Economy seat. I am 6'1" and found the leg room ok, but only because I could get my legs past the bulkhead at the aisle. You cannot do this from 20 A,E,F or K and from B or H you would be tripping the attendants all night long. On the positive side, no one can put their seat back in front of you. Bottom line - avoid this row if you can, unless you are maybe 5'6" tall. First business class flight with EVA and in as much as I'm happy flying economy with them, their business class seems to be on par with many other airlines first class. Just keep in mind that this is an Asian airline, so if you're a bit portly like myself, the pyjamas might not come in your size. At 185cm I found the lie flat position to be a tad on the short side, as the foot cubbie is quite small and as it's angled, it's hard to find a comfortable position for your feet. Food and service was excellent. If it had limited recline, I certainly didn't notice. I felt like the recline was very good. Benefit for sure is having no one behind you to make noise or hit your seat. Pitch was definitely above average, I'm 6'4" and it is definitely more than any US based carrier I've experienced. The IFE was amazing. Large hi-res screens along with a usb charging port. Having it be right in front of the bathrooms, you do hear the occasional flush. At times, there does get to be a line that forms right next to you as well. All that being said, EVA air is great, and having the last row seat is somewhere I'd choose again. Latest Economy seats feels roomier than than United's current seats. Leg room and seat width are nice and roomy. New touchscreen entertainment setup is great. Headphone jack and USB port is below the screen so no fussing around with a remote control or armrest to connect. Seat seemed to have more legroom and had full recline. EVA changed planes for my return leg home from YVR-TPE. Originally seated on the upper deck of their 747-400 in economy (aisle seat); but the plane was changed to their 777-300 product. Seated in 46G (aisle) in economy, with no one beside me in the middle seat. Spacious enough, close proximity to washrooms a plus and one of the first rows to be served food; plus reasonably quick deplaning process upon arrival. Entertainment system worked fine. Under almost every window seat in Elite class there is big metal box restricting leg space.